Suspense continued over who will be the new chief minister of Uttar Pradesh and Uttarakhand, four days after the BJP's resounding triumph in the key Hindi heartland states. A combination photo shows Rajnath Singh, Keshav Prasad Mourya, Manoj Sinha and Mahesh Sharma. While the BJP scrambled to form its governments in Goa and Manipur, where it was not even the single largest party, hurriedly cobbling together post-poll alliances, amid the charge of "stealing" the mandate, the party leadership is taking its own sweet time to decide the chief minister of the country's most populous and politically significant state. Similarly, efforts are on to decide the new chief minister in Uttarakhand where the saffron party won 57 seats. In the hilly state, several senior leaders are being considered as front-runners for the post. Union home minister Rajnath Singh, the tallest party leader from Uttar Pradesh and a former chief minister to boot, is said to be among the front-runners for the coveted job, but he was dismissive about the possibility. "Kya faltu baat kar rahe hain (what nonsensical talk are you doing)," he retorted when asked by reporters outside Parliament House whether he was a contender. Rajnath described the speculation about his return to state politics "unnecessary and futile". Singh has vast administrative experience, including as UP chief minister in 2000-02. As speculation swirled about the possibility of a BJP legislature party meeting on Thursday, the party's state unit chief Keshav Prasad Maurya said, "The picture will be clear in the next two to four days." When asked whether all 312 newly elected BJP MLAs will meet here on Thursday as reported in the media, Maurya, a Lok Sabha MP and himself in the running for the top job, said, "No such meeting has been convened in the first place. So, there is no question of holding or putting it off." Maurya said the meeting will take place whenever the party leadership decides. However, at the daily media briefing of the home department, IG (Special Task Force) Ram Kumar, while responding to a question said Prime Minister Narendra Modi could visit Lucknow on March 17. "Prime Minister Modi may visit Lucknow on March 17. Preparations are going on (in anticipation). IG (Lucknow Zone) is monitoring all the preparations," he said. He, however, maintained he had no knowledge of whether it was in connection with the swearing-in of the new government. The names of a host of leaders, including some sitting MPs are doing the rounds in political circles. 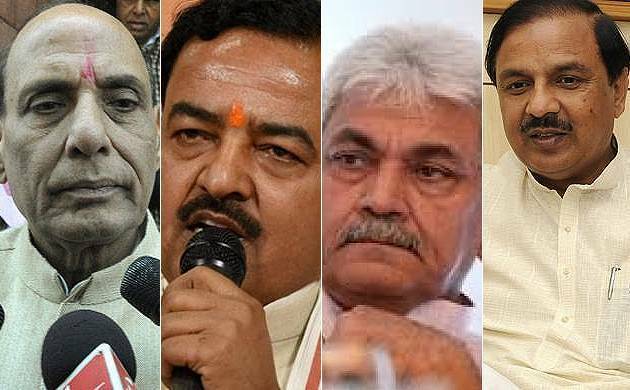 Among them is that of Manoj Sinha, an upper caste Bhumihar from the 'Poorvanchal' belt where Prime Minister Narendra Modi's constituency Varanasi is also located. Sinha, MP from Ghazipur, is serving his third term in the Lok Sabha and was given independent charge of communication ministry by Modi last year after he impressed him with his performance as minister of state for railways. While Singh and Sinha are upper caste Thakur and Bhumihar respectively, Maurya has emerged as the OBC face of the party. His elevation as state BJP chief, many feel, helped rally non-Yadav backward castes around the party. Given the sheer sweep of BJP's victory which extended beyond geographical and caste boundaries, the party can have the luxury of nominating a person for the top job who can deliver on Modi's development agenda and the promise of putting down alleged lawlessness in the state under Samajwadi Party. Rajnath Singh, a senior leader said, fits the bill because of his stature and administrative experience. He was also capable of bridging caste faultlines. Top party sources told PTI in the national capital that barring Modi and BJP chief Amit Shah, who have been holding consultations over government formation, hardly anybody had any real clue as to what was happening behind the scene.